In the years since Luther’s passing, one constant has remained to define his life and musical success: the voice. Like any great singer of the past 100 years, Luther Vandross’ voice and distinct singing style led to not only monumental success, but an instant recognition when you hear him singing–through your stereo, car radio, on TV or in a movie. Bing. Frank. Billie. Robeson. Aretha. Diana. Dionne. Whitney. Mariah. Michael. Marvin. Luther. It is rarified company, but indelibly classic and everlasting in the annals of American music and a club in which Luther Vandross’ membership is permanent. Coupled with that voice was Luther’s unique ability to write and sing about love and the shared emotions we all feel in that search for and enjoyment of love. Love of family, friends, that special someone–all were themes Luther explored with his music regularly, reaching many. Through his songs, for the last two generations Luther Vandross became a staple in the most joyous moments of people’s lives. At the time of Luther’s death in 2005 following complications from a stroke two years earlier, Luther had been in entertainment for 35 years. From his introduction to the world as a singer on the first season of PBS’s Sesame Street in 1969 to winning four Grammy Awards in 2004, Luther was a permanent and dynamic force in popular music. He crossed boundaries, starting with his earliest success as a background vocalist and arranger for David Bowie, Bette Midler, Barbra Streisand, Donna Summer, Carly Simon, Judy Collins, J. Geils Band, Ben E. King, Ringo Starr and Chic. He produced records for Aretha Franklin, Dionne Warwick and Whitney Houston. He wrote one of the climactic musical numbers (“Everybody Rejoice”) for the Tony Award-winning Broadway musical and Academy Award-nominated film The Wiz. Luther’s reach is extensive enough that CBS Sports has used his rendition of “One Shining Moment” for their coverage of the NCAA Men’s Basketball Tournament since 2003, and Luther performed the National Anthem at Super Bowl XXXI in January 1997 in New Orleans. 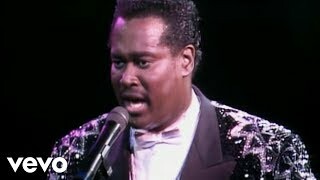 Luther Vandross was a musical master whose style has influenced an entire generation of today’s vocalists. His distinctive brand of satin smooth vocal magic moved international audiences and continues to touch people to this day.